Welcome to the hiking area Plose! On the Plose you can fully enjoy your summer holidays. It does not matter if you stay for a day or a whole week. 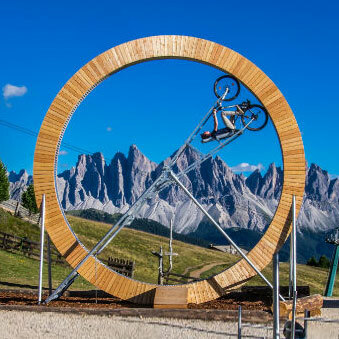 Plose offers you a whole range of possibilities to spend your holidays in South Tyrol. Indeed, in summer Plose is the favorite destination for all families looking for adventure and entertainment, for those who love hiking on easy and challenging trails, and for those who want to enjoy a few relaxing hours, or decide to take a trip on a mountain bike. Our guests love the hiking trails, especially WoodyWalk, our family trail full of attractions. They are enthusiastic about the mountaincarts, kind of gocarts that allow you to run downhill for 9 km until you reach the bottom station of the gondola lift again. Last but not least on the Plose a number of caches are hidden for friends of geocaching. The breathtaking 360 degree view from Plose is also known outside Southtyrol. The view extends from the Stubai Alps to the Dolomites and the Ortles. Many consider it the most beautiful view of the Dolomites, directly on the outskirts of Brixen. Outstanding also the view of the old episcopal city of Brixen in the middle of the Isarco Valley, that borders the High Isarco valley and the High Pusteria Valley. 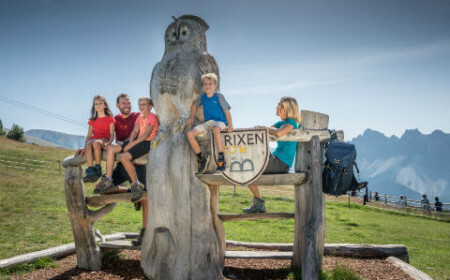 Brixen Plose – summer and winter a mountain full of entertainments, for a summer holidays on its best. This trail is just right for children and grown-ups. On the circular trail you can let off steam on a number of creative attractions – such as the giant sledge, the wooden oxen or the giant snake . Along the trail you can enjoy great views of the Dolomites in the midst of a fantastic landscape. WoodyValk takes you for 2 km to the mountain inn Rossalm and on another 2 km back, presenting 100 m of vertical rise altogether. As a proper family trail it is also suitable for hiking strollers. The perfect fun sport for any fitness level and children from 9 to 99 years old! Get your mountaincart and start at 2.050m a.s.l., right next to the mountain station of the gondola lift. Dash down the 9 km into the valley and feel your heart beat. You can rent out the mountaincarts at the top station of the gondola lift. Together with your mountaincart you also get a helmet. The Plose is the ideal holiday destination for families. Plose – the hiking area next to the Dolomites in South Tyrol.